The Sun is by far the most important star in the sky because it provides the heat and light that make possible life on Earth. To the casual observer the Sun appears to shine steadily, yet closer study shows changes in its brightness that may influence climate. Also, a “solar wind” of electrically charged particles blows outward incessantly from its blazing atmosphere to the Earth 93,000,000 miles away, and far beyond into interstellar space. 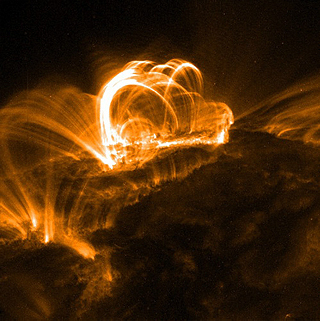 Occasional huge solar eruptions, called flares, can greatly increase this flux of solar charged particles and their energy. Such flares, together with more gradual variations in the solar wind, can seriously disrupt power grids, telecommunications and GPS systems. These influences explain the increasing civilian and military interest in solar- terrestrial research and in the prediction of conditions in interplanetary space, known as space weather. Bright magnetic loop structures in the Sun’s outer atmosphere illuminated by a flare in a sunspot region. Imaged in ultraviolet light by the TRACE space – borne telescope. By permission of the Lockheed Corporation. 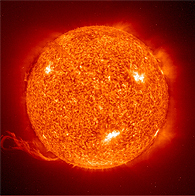 The Sun is also the closest star, and the only one whose surface can be imaged in any detail. Thus, solar research provides astronomers with a unique opportunity to study many of the basic physical processes that govern the Universe, in much greater detail than by observations of more distant stars and galaxies. Our past research began in the 1960’s to 1970’s with studies of the interstellar material from which stars like the Sun originally formed. Since then we have studied a broad range of solar topics such as the Sun’s rotation and its convection of heat and magnetic fields from the deep interior to its visible surface. With colleagues at several universities and national laboratories we have also studied the vast loop – like structures in the Sun’s million degree outer corona, and searched for intense electric fields in this coronal atmosphere. We were amongst the first to initiate quantitative study of the Sun’s brightness variation in the 1970’s and also developed new techniques such as cryogenic radiometery and bolometric imaging, to help improve such brightness measurements. While Heliophysics Inc. was dissolved in 2015, our research continues on the Sun’s output variations, solar/stellar magnetism and heat flow. A violent eruption of hot coronal gas from the Sun’s surface, captured on an ultraviolet image of the solar disk by the Coronal Diagnostic Spectrometer flying on the SOHO spacecraft. By permission of NASA.